Let’s get the political piece out of the way first: In today’s Non Sequitur, Wiley Miller comments on the new rules for press briefings at the White House. I’m okay with the new format, not because it’s a victory for press freedom, of course, except to the degree that it is. I don’t believe in being overly confrontational, but a little pushback is a good thing and I was always suspicious when sources became cooperative. It usually meant they were feeding me a line. As said the other day, when some company sent you a release saying there would be a new building and it would be this tall and have this function, you could pretty much re-type it, though you had to do more if you wanted a byline for the story. But being a passive conduit is not journalism, and, certainly at the White House level, the daily presser should only fill in the blanks, not provide the story. The combination of Sarah Sanders’ sarcasm and her willingness to lie through her teeth seems to have sent more than a few reporters off to do their own digging and that’s not a bad thing. And when CNN went to court to restore Jim Accosta’s press credentials, Fox News was first to file an amicus brief. And there has been some hand-wringing over the fact that, instead of a comedian at this year’s WHCA dinner, they’re having someone serious talk about the state of press freedom or some such thing. Could this be the end of Nerd Prom? Tune in next spring! With Florida having passed a referendum to ban dog racing, there will shortly be a whole lot of those gentle, quiet dogs up for adoption. And the fact that I can relate to today’s Bliss tells you why I won’t adopt one. Greyhounds require a soft touch, and, like the writer in this cartoon, I’m more apt to get into a circle of, well, barking at each other, which would crush the spirit of a greyhound (or Brittany or several other soft-touch breeds). All dogs should be treated humanely, of course. But there are breeds who are quite content to be in a bickering Leroy and Loretta Lockhorn relationship with their owners, and those whom it would terrify and traumatize. Know thyself. And then know what thou art getting into. Maeve is in a slightly different situation than usual in this new Between Friends arc, because the fellow her assistant is trying to set her up with is apparently as reluctant to be matched up as she is. The rebirth of Popeye comics has been mentioned elsewhere on Daily Cartoonist, with a link to a New York Times article that is worth one of your freebies, since it has good quotes from people who know about this sort of thing. 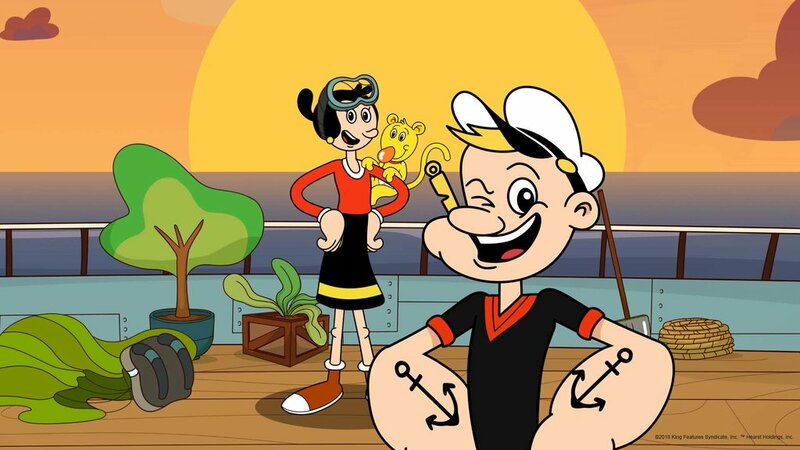 For my part, I’m not sure Popeye needs to be reborn, because it’s not like very many little kids have an outdated vision of him to be kindled into a flame. Generally, when there is a re-birthing, it’s of a childhood figure like Peabody and Sherman or Underdog being re-birthed for the Peter Pan generation. The kid-aged kids — being new on the planet and not aware of who anyone used to be — are just as happy to meet Shaun the Sheep as their parents were to meet Dora the Explorer and their grandparents were to meet Grover. And somebody in the middle was happy to meet the Teletubbies and that may be closer to this demographic target, at least for the animations. We’ll get to them in a minute. We should first point out that Popeye was not conceived as a children’s figure. Thimble Theater, as seen in today’s Vintage strip from 1935, relied on a level of wit over the heads of young comic readers, though this particular strip doesn’t. Just as the folk tales we think of as children’s stories were originally told around the fire to the whole community, Popeye’s initial ventures were in the funny pages and on the movie screens for everyone, not just the kids. Ditto with Bugs Bunny, of course, which is why Popeye could mutter things under his breath and Bugs could be an unrepentant wiseass, such that their hijinks operated simultaneously on a couple of levels. Rocky and Bullwinkle flipped this, so that the kid level was topmost and the gags for adults were secondary, and a lot of Muppet humor did the same, at least under Henson’s own direction. But that’s a tough creative line to walk and most attempts have failed. 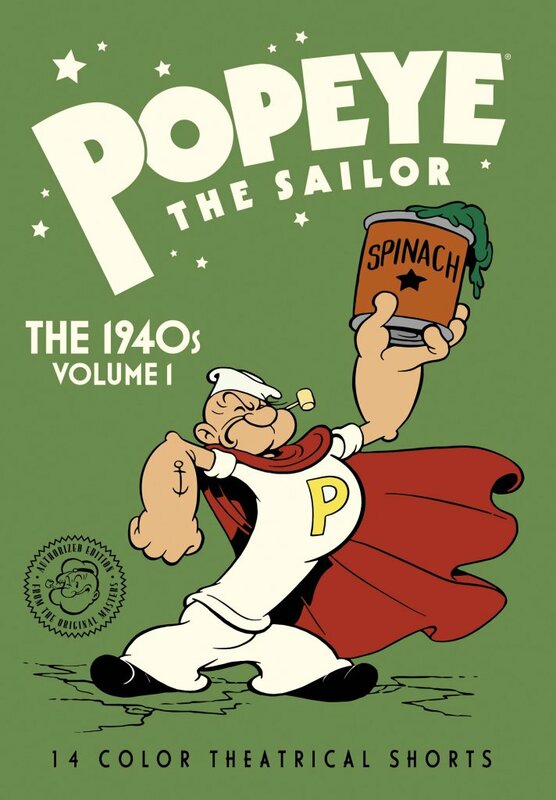 Popeye fans learned to watch the credits on the cartoons and sort the old theatrical cartoons from the more modern ones made with kids in mind. For those who yearn for the crusty old sailor, Johanna Draper Carlson reports the release of a new set of old animated cartoons that apparently we never saw on afternoon TV back when that was a thing. And it releases Dec 11, so if you use the link she provides, you could have it in time for Christmas gifting. Whereupon Grandpa provided her and her sisters with a collection of videos of classic Popeye and Bugs and Daffy, because it is the mission of the old to educate and corrupt the young. As said, I’m not clear on the need or the gain, but YMMV. And you know they’ll gut the one thing that was in almost every Popeye episode: the ongoing fights. Because… you know… cant have that sort of thing. Side note about those: I came across an animated gif of one of those classic dust-ups that was made from the actual frames of one of the 1930s cartoons. The amount of physical exaggeration in those sequences is amazing, and you’d never know it was there because it all moves so fast. Certainly wont see *that* with this sad little Flash-animation reboot. Also no pipe. He puts a whistle in his mouth and blows it. And his squinky eye, on closer examination, is merely an affectation that moves from side to side as needed. I suppose they’ll work on his legs next. Can’t have kids imitating that! That link for the Popeye disc was helpful. Another great and unique Christmas gift for the family.